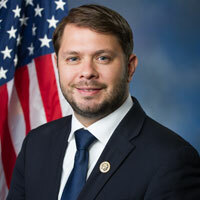 Congressman Ruben Gallego is the son of Hispanic immigrants, a veteran, and a community leader. He was the first in his family to attend college, graduating from Harvard University with a degree in International Relations. He later joined the Marine Corps, serving in Iraq with the well-known combat unit Lima 3/25. Congressman Gallego was elected to the Arizona House of Representatives in 2010, and served until 2014. He represented District 27, which covers much of Phoenix. He rose quickly in the state legislature, serving as Assistant Minority Leader. Congressman Gallego became known for his tough stand against extreme legislation pushed by Republicans in the state legislature. He led the opposition to the discriminatory SB 1062, which Governor Jan Brewer ultimately vetoed. As a state legislator, Congressman Gallego also led the push for Medicaid expansion and to secure in-state tuition for veterans. During his first term, Congressman Gallego fought tirelessly on issues including education, job creation, access to higher education, veterans’ issues, and immigration reform. Making Arizona a better place to live, work and raise a family is his top priority. In his first year in Congress, Congressman Gallego introduced the VETS Act, which would reduce the burden of student loan debt on veterans and has supported legislation to increase the hiring of veterans and provide additional benefits to wounded or deceased veterans and their families. Congressman Gallego helped lead the effort to strengthen and restore the Voting Rights Act in order to ensure that all Americans have access to the ballot box. He also authored legislation to encourage gun dealers to be stronger community partners in the struggle against gun violence and to crack down on irresponsible gun dealers. Congressman Gallego serves as an Assistant Whip for the Democratic Caucus, the First Vice Chair of the Congressional Hispanic Caucus, Vice Chair of the Congressional Progressive Caucus and Congressional Progressive Caucus Tribal Liasion, and Vice Chair of the Equality Caucus. Congressman Gallego currently serves on the House Armed Services Committee and the Natural Resources Committee, and serves as Chair of the Natural Resources Subcommittee for Indigenous Peoples of the United States.